In the blink of an eye, the sportsmen dropped the fishing rods and took up the shotgun. Duck season was to open on the Saturday before Thanksgiving and whether or not they had been scouting, hunter’s would fill South Carolina’s swamps, lakes, and rivers in the morning to come. Bo Hutchison and I teamed up and launched his John boat early in the morning on a lake to claim our spot. He admitted that he had not scouted the place, but his past observations led him to believe that after the recent rain and high waters, the ducks would be landing in a spot where the bank is not usually submerged. After a cold boat ride, the bow of the boat nudged into the trees and hidden. From this point we had a short hike through the flooded timber to the place where we planned to hunt. 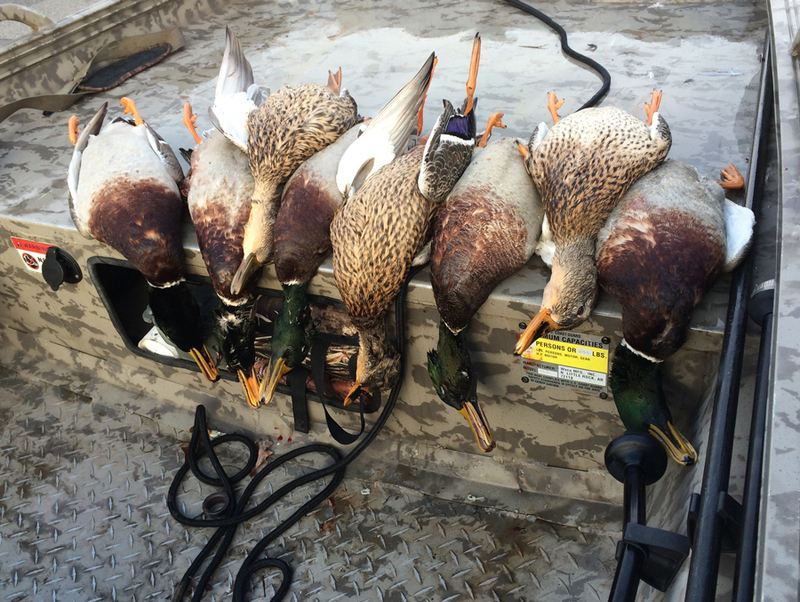 The water was no higher than our knees and we gathered guns and decoys to set up. An important thing to remember while walking in waders, especially when the bottom is not visible, is that it is impossible to swim wearing waders and you must be certain not to step into a deep hole or drop off. The best way to walk is by almost shuffling your feet in order to avoid sinking. We walked into a small opening in the trees and decided that this would be the place to make our stand. We only used ten decoys and two of the decoys were tied to a jerk string. A jerk string extends to one person who can tug on the decoys giving them life like swimming motion when seen from above by incoming ducks. Between the calling and the decoys, we were able to catch the attention of the first flock of mallard ducks. They passed before shooting time and turned to look again. They passed several times, each time closer and closer to the water. Finally Bo whispered, “clear to shoot!” and as the ducks rounded the corner, our guns broke the silence. Of the eight mallards in the group, five were laying belly up in the water. If I were not to hear another duck for the rest of the day then I would still consider this to be a successful hunt. There was no time to collect the ducks or to celebrate because more were passing. The ducks could not resist visiting our decoys and a flock of two flew in exactly the same pattern as the group before. We opened fire and both ducks splashed into the water. One duck landed far behind us and Bo rushed through the woods to make sure it did not escape. At that moment, a pair of mallards passed overhead and knowing that they would not stop after seeing us in motion, I fired on the trailing duck which folded stone cold dead and splashed in the water beside Bo. By the end of the hunt, the two of us had shot down eight mallards. The difference between this hunt, and most of my duck hunting along the Pee Dee is first of all, there is no rush to retrieve ducks being that there is no current in the lake. This made for a much more relaxing hunt than if we were fighting the current and exposing ourselves. These mallards seemed to be much more reactive to decoys and it was not the duck calls that lured them, but the decoys and jerk string. This is a big difference for me as I have often found that wood ducks can care less about decoys in many occasions. Another difference for this hunt is that the mallards yield almost twice the meat of a wood duck, and we each went home with enough duck meat for a cookout. I used my duck meat for a new recipe of Philly Cheese Ducks. Duck hunting can be very unpredictable and I was reminded of this after returning to the same spot over a month later. We prepared for a hunt and didn’t even see one duck. Everyone hears about the successful hunts but between each success are many misses. The ducks are always on the move and keeping in the know requires constant scouting. I wish the best of luck to all of our Dillon hunters out there this season!